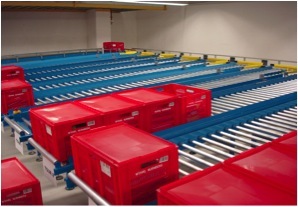 Gravity Roller Conveyors the cost effective solution for transporting unit loads. 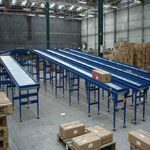 Gravity Roller Conveyors are considered the most economic and cost saving solution to many materials handling needs. 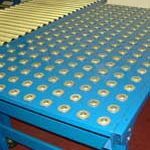 The rollers have low friction and are free running to allow goods to be moved without the intervention of powered drives. They suit most flat based goods or those which are transported in flat based containers. 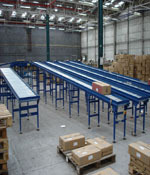 Gravity roller conveyors can either be installed horizontally, without any decline and in applications where the movement of the load is manually controlled or alternatively a shallow decline can be created by adjusting the stand height, allowing loads to be moved under the force of gravity and weight of the load. 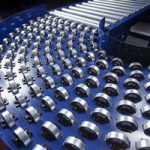 They can also be used in combination with powered conveyors in integrated systems. Recommended for products with a maximum weight of 20kg. (controlled loading – no shock loading). Z section Pressed Steel frame (2.5mm thick) 64mm high. 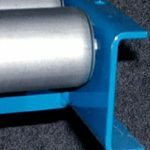 35mm Diameter Steel Roller/20 Kilo Capacity. Either plain mild steel or bright zinc plated finish available. Available in standard roller pitches of 37.5mm, 75mm, 112.5mm or 150mm. Powder Coated Finish to standard: Blue RAL 5010 or White RAL 9010.Other Colours available. 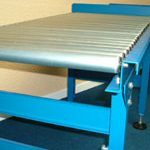 Stainless Steel options available on all conveyors. Recommended for products with a maximum weight of 30kg. (controlled loading – no shock loading). Pressed steel Z section frame (2.5mm thick) 64mm high. 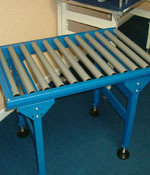 50mm Diameter Steel Roller/30 Kilo Capacity. Either Self colour or Bright Zinc plated options are available. Available in standard roller pitches of 75mm, 112.5mm or 150mm. 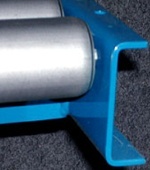 Powder Coated finish to standard: Blue RAL 5010 or White RAL 9010. All products available in Stainless Steel. Product loading with a maximum weight of 10kg. (controlled loading – no shock loading). 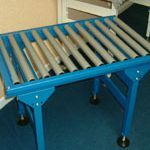 40mm Diameter Grey rigid PVC Roller/10 Kilo Capacity. Standard roller pitches of 75mm, 112.5mm or 150mm. Al products available in Stainless Steel. Product loading with a maximum weight of 1500kg. Check with LVP full application details. Pressed steel C section frame (4mm thick) 100mm high. 60mm Diameter Steel Roller/150 Kilo Capacity. Either Self colour or bright zinc plated finishes available. Standard roller pitches of 75mm, 100mm or 150mm. 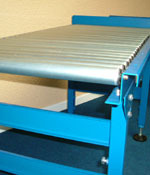 All products are available in Stainless Steel. Standard Widths from 312mm to 1012mm. Ball Pitch 75mm and 150mm. Multi-punched with Holes At 50mm Staggered Pitch. 90° and 180° Spiral Bends Available (Please state left or right). 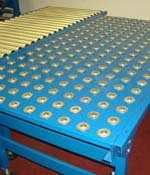 This is our most general-purpose, non powered conveyor. Light and gentle roller rotation ensures smooth and safe transfer of everything from light to heavy cargo. 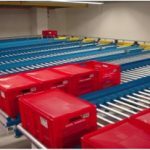 This system is easy to use, features high cost performance, and contributes to labor saving in all types of work processes.